The enclosure shipped a little earlier than expected. FedEx reports it shipped on Monday from Nova Scotia, Protocase e-mailed me about it on Tuesday, and I received it on Wednesday. So let’s fill in a few gaps in the timeline. Before discovering and talking to Protocase, I had started to purchase some other parts. From my local Micro Center, I acquired some 3mm “tailed” LEDs to use as activity lights in the case. 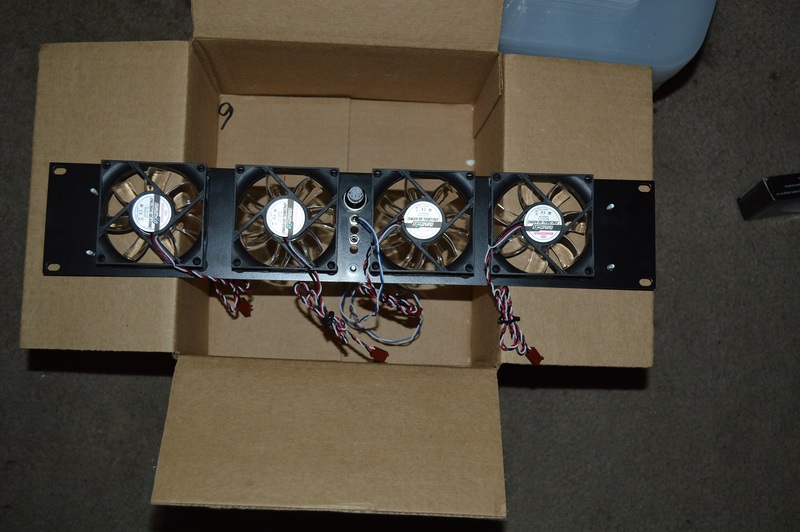 And I already mentioned I had fans — 4x80mm Enermax fans, which is why I configured the case for 4x80mm fans in the front. I don’t have any filters for them yet — more on that later. 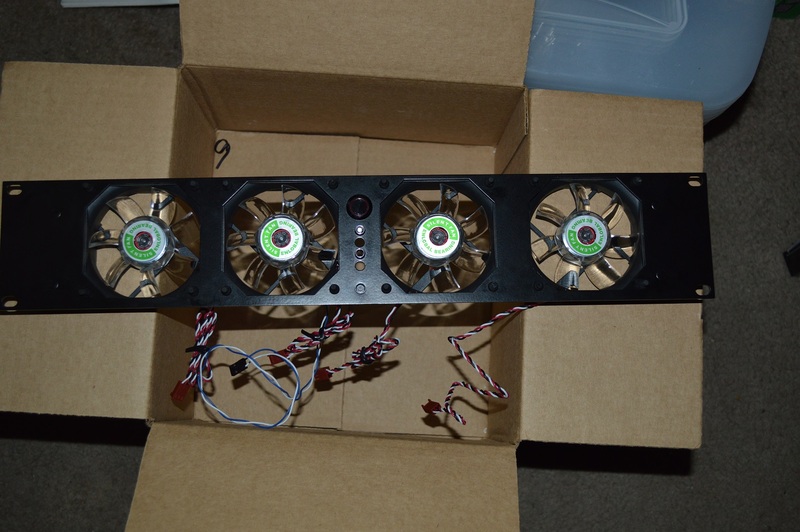 From Performance-PCs I ordered 3x60mm fans for the 60mm fan mounts I had on the rear of the enclsoure. Since I’m going for a reasonably quiet build, the fans I bought were Noctua — who knew they made 60mm fans? — specifically the NF-A6x25. Performance-PCs had them for a good price and, again, I’m wanting to make this reasonably quiet. I also bought holders for the LEDs and a latching vandal-resistant switch for the power switch. There are some parts you can change out to reduce the cost, but not by much. Other 60mm fans are not going to be much less than what I paid for the Noctuas, with the trade-off that they might be louder — I found the Noctuas on special with Performance-PCs for about 9 USD, which tells me they may not restock them when they run out. The Enermax fans were only about 8 USD each from Amazon. I selected the fans in question because I knew they’d be silent. Noctua is one of the best companies when it comes to quiet fans — others come close, but Noctua continually wins out. The color scheme of the fans is why I didn’t buy 4x80mm Noctuas for the front — that and the price (typically around 15 USD each). At least the 60mm Noctuas aren’t going to be noticeable unless you go looking for them. First my thanks to Protocase for working with me with regard to the original quote. But let’s talk the good, the bad and the ugly with regard to this. And let’s start with a simple question: now that I have the actual case in hand, is there anything I’d change about the design? Three things. First is the front face. The four holes I had cut for LED holders are a little too close. They’re the perfect diameter (6mm), but just a little too close together for the nuts that hold them in place, so some of the nuts can’t get a firm hold while others can. So easily I’d space them out a little further. Instead for the enclosure as it currently stands, I’ve ordered some 1/4″ IDx5/16″ ODx5/32″ long spacers to provide a little bit of a gap for two of the holders. I’ll see how well they’ll work when they arrive. 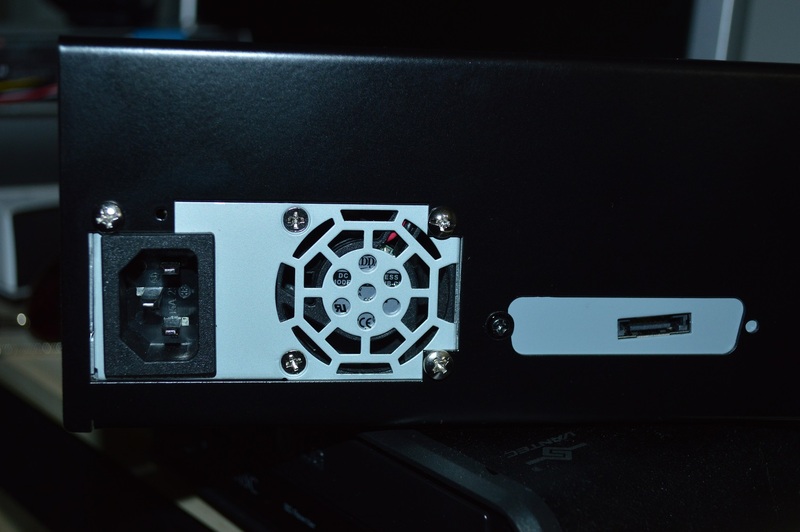 Second is on the rear of the case with regard to the mounting holes for the FlexATX power supply. I didn’t make them large enough to accommodate a #6-32 screw. I have no idea how I screwed that up, but they’re a few hundreds of an inch too small, but a 5/32″ drill bit easily fixed it. The screw holes lined up perfectly as well, thanks to a diagram published by SilverStone Tek. Aside from that, there’s also the cutout I chose for the port multiplier: DB-50. A little research should’ve been done on this first to realize that the port multiplier is dimensioned to a DB-50S cutout, not a DB-50. The difference is that DB-50S is about ½” wider than DB-50. For now, only one of the screws on the back of the port multiplier could be secured. The eSATA port is still accessible, but not in a way I’d be comfortable leaving for the long term. Perhaps I can re-mount the multiplier on a different kind of bracket that will fit in a DB50 port. I’ll look around for options. Okay one other thing: I don’t have the four front fans quite evenly spaced. Needless to say, before publishing the design file, I’ll have a couple modifications to make. The finish on the case is high quality, and the case feels very sturdy. The cutouts for the fans fit their respective fans without any problem. The hidden hardware is also a plus. There are embedded screws on the front and bottom panels to be secured down with an 11/32″ nut — use sockets and wrenches where needed to ensure everything stays secure. Otherwise the enclosure came out exactly as designed and was shipped wrapped in enough bubble wrap to protect a small child. So how did the components fit? 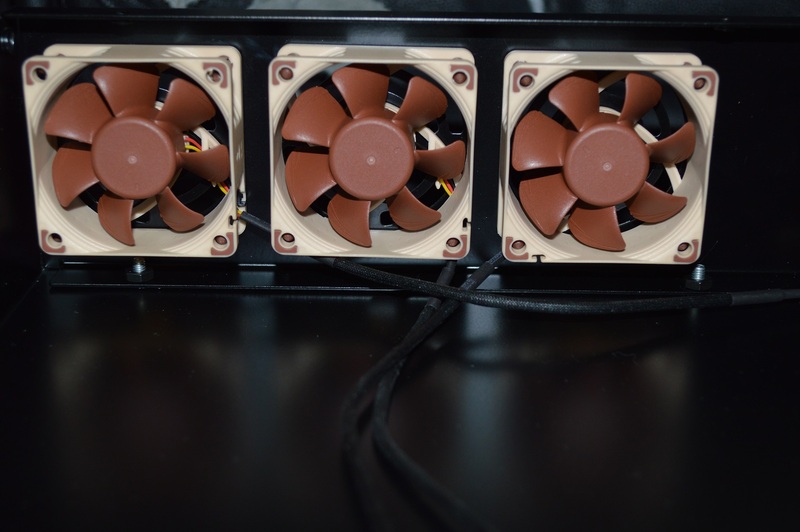 The three 60mm fans mounted without any problem. I’m using the noise isolating mounts that came with them as well instead of screws. The four 80mm fans in the front did meet some small interference from the lip at the front of the bottom panel. But last week I ordered several packs of Gelid rubber fan mounts, intending on experimenting to see what I can do with them to improve the sound profiles of the various computers I have. And they pad out the fans perfectly on the front panel. And I discovered the Gelid mounts can be attached to the fan or the panel first. 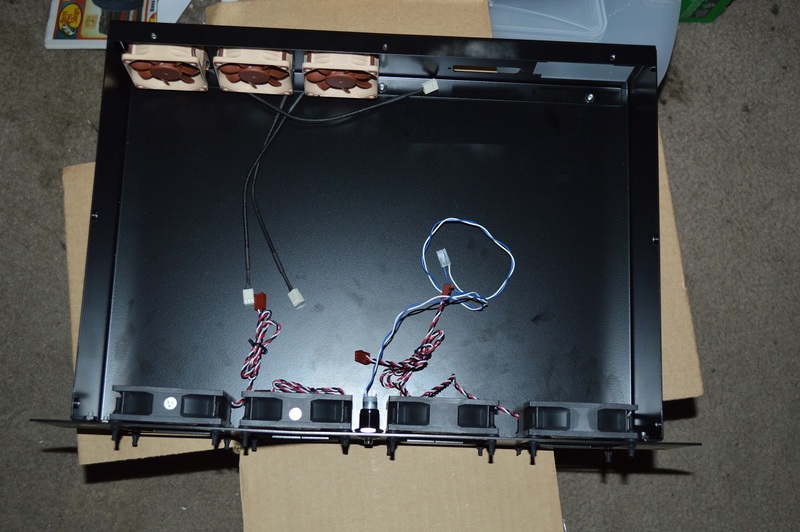 Most vibration-isolating fan mounts require you to mount them to the panel first and then attach the fan to it, which can be problematic in tight corners, such as the front panel of the enclosure. But it wouldn’t have worked anyway as it would’ve been difficult getting the front panel flush with the lip on the bottom panel. 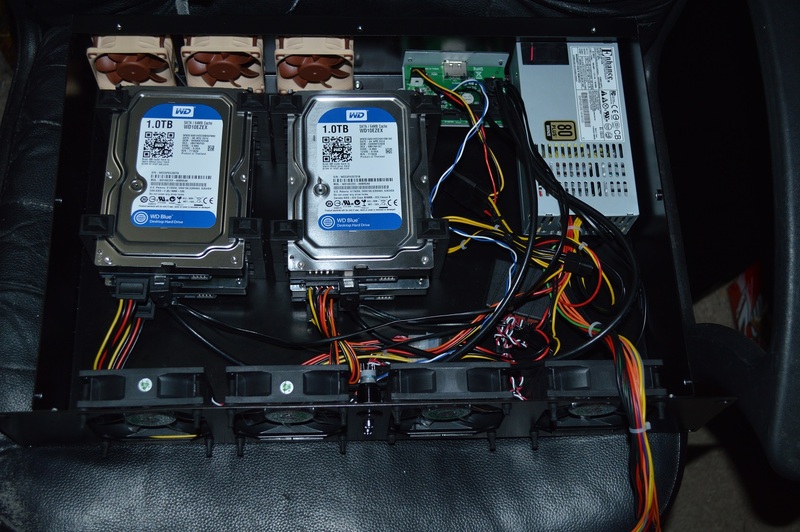 The ability to attach the mounts to the fans, then the fans to the front panel was a major bonus — and in small form-factor computer builds, such as microATX or miniITX cases, I can see that making things much, much easier. I’ve ordered filters from modDIY as I wanted filters that wouldn’t stand out. I also ordered a power supply jumper switch as well. They ship from Hong Kong, so I can go without them in the mean time. Not sure if I’ll end up practically destroying the fan mounts getting the filters put on, so it’s a good thing I’ve got plenty of them. They’re somewhat difficult to work with as well — pliers will come in quite handy trying to get these installed — so perhaps different vibration isolating mounts are in order. The jumper switch I ordered since it’s a lit jumper switch, meaning I can just cut the switch off its wires and attach the vandal resistant switch to the PSU adapter. Ideally I’d be soldering it, but I’m not sure if I’m going to do that. For powering the fans, I purchased an NZXT Grid from my local Micro Center — with 7 fans, something was going to be needed to keep this sane. A SATA power splitter powers two of the hard drives while the two SATA connectors from the PSU power the other two. And the Agestar HDD “bumpers” came in handy this time as well for holding the hard drives — I do still have the CaseLabs HDD brackets, but opted against them for this, in part because I misplaced the hardware for it. Right now there’s not much in the way of cable management. Eventually I’ll take some 3M Command clips — I used them in Absinthe and Beta Orionis — and use those to help with the cable management. They work much better than zip ties alone as they will pull and hold the cables out of the way. For the power switch I’m currently using an ATX power switch I’ve used previously to jumper a spare PSU when bleeding the water cooling loops. I have one LED run currently to the eSATA activity light. I intend to have four LEDs total for each of the four individual HDD activity lights. Until I get all the small parts necessary to finish this up, I do at least have it running inside the enclosure to make sure everything works. I have stuff on the way from two companies to finish this out. And so far the fans are quiet, comparable to the fans in Beta Orionis at least. And it’ll probably be a little more quiet once I get the cabling better managed. If necessary I do have noise dampening material as well I could put on the sides and top of the enclosure to help curtail noise even more. When I tested the fans without anything else in the enclosure, you’d have to be right up near the enclosure to hear the fans due to the airflow’s clear path. Everything that’s in the enclosure now is creating turbulence, so there’s some noise. I’m not expecting to completely eliminate any noise, but at least have it so that it’s not going to be noticeable.